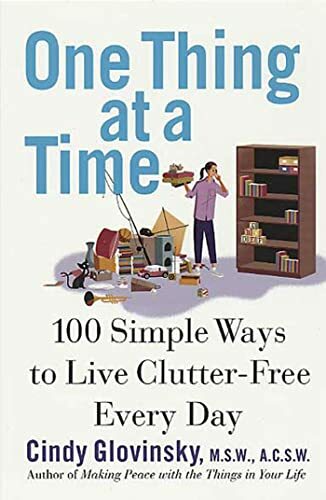 Praise for "Making Peace with the Things in Your Life"
"Glovinsky is a compassionate, talented organizer who understands the root causes of people's clutter woes. This is a really helpful book." - Judith Kolberg, author of "Conquering Chronic Disorganization" and co-author of "ADD-Friendly Ways to Organize Your Life"
"Glovinsky asks readers to examine the underlying psychological issues that they have with things....She takes Julie Morgenstern's "Organizing from the Inside Out" to the next level." Glovinsky asks readers to examine the underlying psychological issues that they have with things....She takes Julie Morgenstern's "Organizing from the Inside Out" to the next level. "Library Journal on Making Peace with the Things in Your Life""
A practical guide to getting oneself organized introduces one hundred simple techniques and strategies for de-cluttering one's life, from throwing away coupons and purging deep storage areas to practicing toy population planning and storing it where one uses it. Original. 15,000 first printing.